Jake Sampson could write a book. 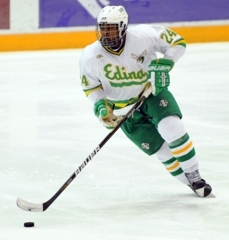 “You just keep peppering him and you hope that he is going to make a mistake one time,” the Edina senior said. “I know the goal that I got he definitely didn’t see. 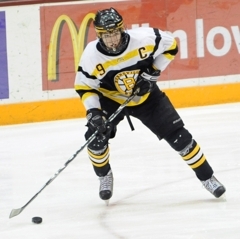 As it turns out, neither Sampson nor Burnsville’s Bodhi Engum, the “good goalie” in this case study, got a good look at the goal that decided the Section 2AA championship on Wednesday, March 2, at Mariucci Arena in Minneapolis. Sampson was sprawled on the ice by the time his shot from the top of the circles zipped through traffic, past Engum and into the net, pinging in off the right post. After recovering from a shaky start, Engum was unbeatable in second period and through most of the third – as long as he could see the puck. The senior finished with 28 saves. 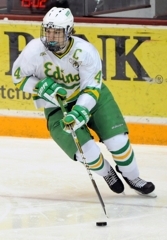 A power-play goal Steven Fogarty, also taken from long range in the third period, sailed high through heavy traffic in front and got past a screened Engum. That goal tied the score at 2 with 7:19 remaining and set up the dramatic finish starring Sampson. 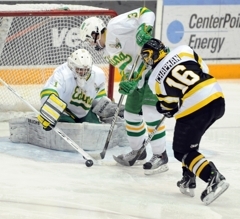 Sampson was on his back looking up at the Mariucci Arena rafters when it became obvious he had scored. The Edina cheering section erupted and he was mobbed by teammates. There was another, crazier celebration after the final horn sounded. Say this about the defending state Class 2A champion Hornets, who will be making their fifth straight state tournament appearance: they sure know how to form a dog pile. “It was amazing,” Sampson said. “Laying there, looking up at the ceiling. That’s not usually where you want to be, but at this time it is the greatest spot. Teammates on top of you. 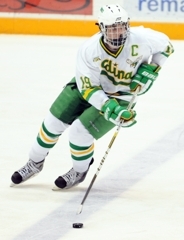 Senior Jake Sampson scored with 1 minute, 11 seconds remaining to propel defending state Class 2A champion Edina back to the state tournament with a 3-2 victory over Burnsville on Wednesday, March 2, in the Section 2AA championship at Mariucci Arena in Minneapolis. 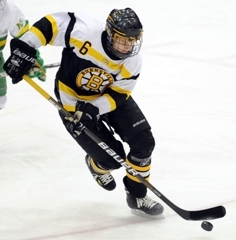 Sampson’s shot from the slot sailed in high and off the right post, beating standout senior Burnsville goaltender Bodhi Engum. 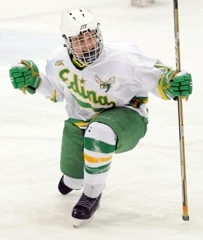 Senior Steven Fogarty scored a power-play goal on a blistering shot from the point with 7:19 left in the third to pull top-seeded Edina (18-7-2) into a 2-2 tie. No. 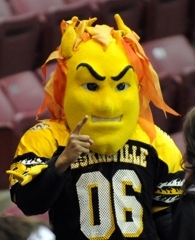 2-seeded Burnsville (19-5-4) had taken a 2-1 lead 15 seconds into the third when Jace Childs scored a power-play goal on a spin-o-rama shot from close range. 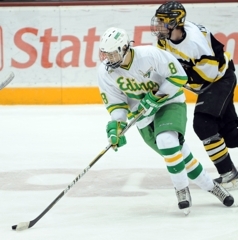 Edina’s Lou Nanne and Burnsville’s Jake Senta traded goals in the first period. A scoreless second set up the dramatics in the final period. Engum finished with 28 saves for the Blaze. Senior Connor Girard, the Hornets’ goaltender during their state title run last season, made 15 saves. The senior forward said he couldn’t see his winning goal with 1:11 left because he had fallen to the ice after shooting, “but I heard it was a good one,” Sampson said. Yes. Yes it was. 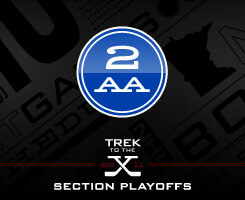 The goal was Sampson’s third in three playoff games, giving him 11 this season. Engum was fighting the puck a bit early, but by the second and third periods the senior goaltender was his usual stop-everything-in-sight self. Engum made 11 of his 28 saves in the third period when the Hornets bombarded him with shots, most of them hitting Engum high in the shoulder and arms. 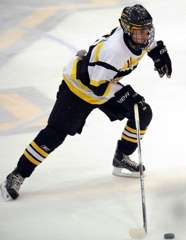 The sophomore forward scored the Hornets’ first goal, hit the crossbar at least once and was responsible for several of the high-velocity shots fired at Engum.